The Jin have purple skin, clawed fingers, and lack the protruding ears that define many humanoid races. In the center of their foreheads, they possess a third eye which they call the "deatheye". This eye allows them to "see" some kind of "shadow" (for lack of a better word) of recent deaths in the area. 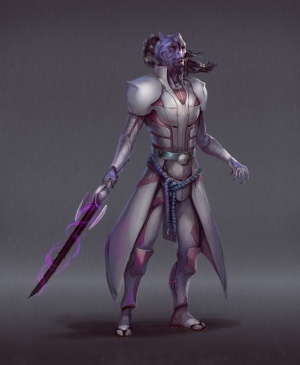 The Jin are one of the few races in the Starmourn sector that we are sure originated outside of it, for they arrived here only a few hundred years ago, though they are, it is believed, about 20,000 years older than even the Shen. The Jin that we know in Starmourn are a large alliance that fled a mad Godking ruling a far-off home system called Ijzala. He had allied with the Ishvana to seize ultimate power, then created a death religion around himself, perverting the traditional Jin relationship with death. The Godking, directed by the Ishvana, began to slaughter hundreds of millions of Jin. The Jin adhere to the belief that death is merely the self piercing the veil between this plane of existence and another. 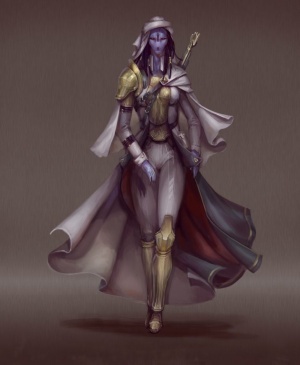 Though other races scoff at this idea (arguing that it is a cultural remnant of old superstitions and religions), the Ishvana considered that perhaps the Jin were correct, and that their genocide might inform its search into transcendence. Was the Ishvana right? We don't know, for every Jin we have ever encountered are among the Departed - a huge alliance that fled their insane Godking and the even more powerful Ishvana. The Departed seized the Blood Ark - one of the three huge worldships constructed by the Jin at enormous expense to someday carry the over-populated Jin to new systems en masse. Together with the fleet of warships this alliance had cobbled together, they fled the Ijzala system, forever. For nearly 150 years they wandered, seeking a new home, where they might plot the eventual return of the Departed to Ijzala, or at least revenge on the Ishvana and their Godking, if he yet lives. The Jin were first detected in Starmourn Sector in the year 212 A.E. (After Earth), as humans reckon time, two years after the Second War of the Ishvana had begun. Loathing the Ishvana, and enraged at having effectively lost their home, the Blood Ark and its accompanying fleet homed in on their enemy's forces in Starmourn sector, smashing into an alliance of Bushraki, Vendal, Sa'hak-ren, Inori, and Xariel and devastating it. This was not without cost, however. The Blood Ark's fleet, and the Ark itself, took heavy damage, but their arrival turned that war's tide in favor of the races of the Song Dominion, Celestine Ascendancy, and the budding power base at Scatterhome. At the conclusion of the war, the Jin slowly took their heavily-damaged Blood Ark to the home system of one of their new allies - Scatterhome. They felt that by aligning with other relative newcomers to Starmourn - the humans - they would be in a stronger negotiating position, vs. allying with the much-more established races of the Song and Celestines. As the decades passed, the Ark continued to require maintenance and repair, and the expense of maintaining it was enormous. They were effectively refugees, albeit strong and well-equipped refugees, but they were still finding their place in Starmourn and building industry to sustain themselves. Eventually, the decision was made to power down the Blood Ark, which would involving destroying the massive power source at the center. It was designed to as a near-perpetual energy machine, able to sustain the Blood Ark for a thousand generations if necessary, but it was not designed to shut down. Once deactivated, it was lost forever. Eventually, the Blood Ark became as much a source of raw materials for Scatterhome as a home for the Jin. Many of the Jin eventually left it to live on the asteroids of Scatterhome proper, and some left to find their fortunes elsewhere in the sector. As the Ark slowly became less populated, sections were permanently decommissioned and slated for salvage. By now, hundreds of years later, the Blood Ark resembles a decaying skeleton, with but one large section left untouched - the living quarters of the Jin that remained on the Ark.